It's Christmas week! If you haven't already, it's time to finalise your Christmas shopping and get ready for the big day! I loveeeee Christmas, however, this year I feel like it's snuck up on me! I've had my Christmas shopping done for months (because I'm one of those weird stupidly organised people who starts planning next Christmas the day after Christmas :P), however, my Christmas baking has fallen by the wayside as we've been so busy lately! But busyness shouldn't mean you have to miss out on delicious treats - so I've been coming up with some delicious recipes that take just minutes to whip together. Best of all, there's no packaged or boxed mixes in sight - just simple, made from scratch recipes that everyone will love! 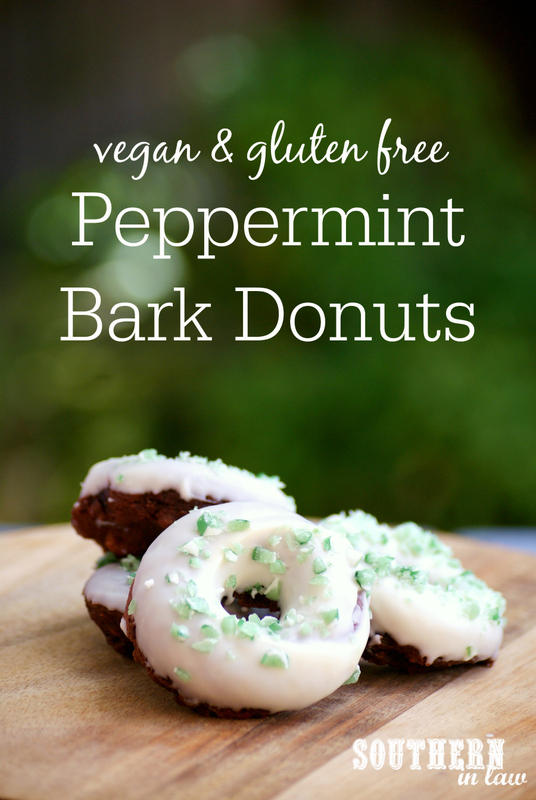 These Vegan Peppermint Bark Donuts are one of those recipes that is fast, easy and guaranteed to be a hit! They're vegan, gluten free, low fat and lower in sugar to ensure there's something for everyone - and they taste absolutely delicious! But you didn't come here to hear me ramble on, did you? You came here for the recipe! Preheat your oven to 180C/355F. 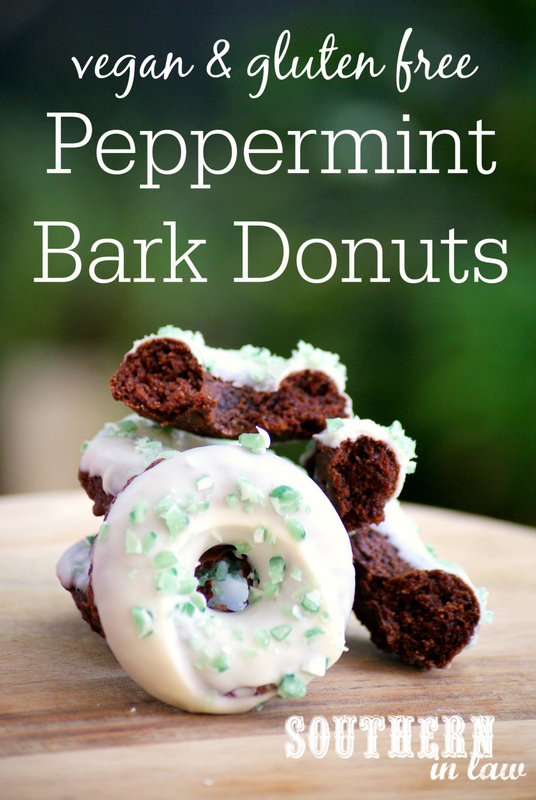 Lightly grease your donut pan (or muffin tin if you don't have a donut pan) and set aside. In a medium mixing bowl, add your milk and apple cider vinegar and leave to sit for a few minutes whilst getting out all of your other ingredients. Add your oil, applesauce, vanilla and sugar to your milk mixture, mixing until combine. Sift in your flour, cocoa, baking powder and baking soda and mix until just combined. The mix will be quite thick, however, you should be able to mix it through quite easily. Fill your donut pans 3/4 full (or use a muffin tin if you don't have a donut pan), smoothing out the mix to ensure it's spread evenly and the tops are relatively flat. Once all of your mix is in your pans, bake your donuts for 8-12 minutes, or until cooked through and a skewer inserted into the centre removes clean. Allow your donuts to cool completely before topping. 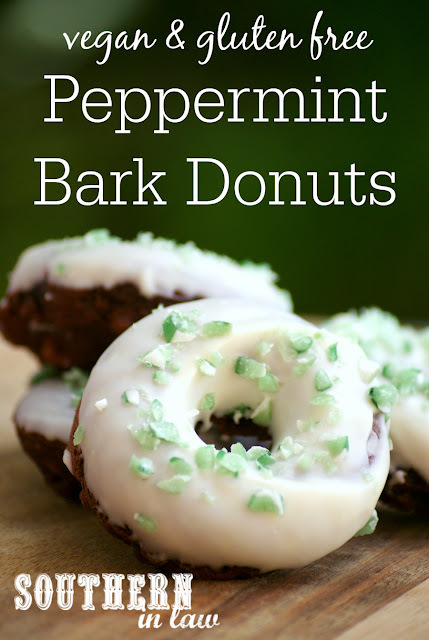 Once your donuts are cooled, melt your white chocolate in a small mixing bowl either over the stove (use the double boiler method) or carefully in the microwave in a microwave safe bowl. 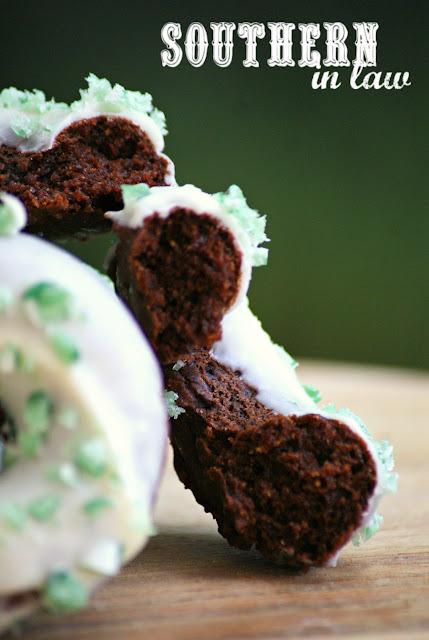 Dip your donuts into your white chocolate (you'll want to use the "smooth side" as your top) and then place onto a baking tray lined with baking paper, sprinkling with your crushed candy canes and allowing to set. Repeat until all of your donuts are topped with the candy cane topping and allow to set before serving. The chocolate will set at room temperature, however, it may take a little while (depending on the temperature). If you want to speed things up, you can pop them into the fridge/freezer for the chocolate to harden. These donuts will keep for 2 days (they've never lasted longer than that for us so we're not sure if they last longer!) in an airtight container at room temperature. You can store them in the fridge, however, we find they taste best at room temp! *Use more/less sugar depending on how sweet you like your baked goods. We used 1/4 cup as we found they were sweet enough with the white chocolate and candy cane topping! But tell me, are you ready for Christmas?! And have you been baking/cooking any holiday recipes lately?